Alaska Native News Sep 18, 2018. 10-year-old Ashley Johnson-Barr. Image courtesy of Walter Barr. 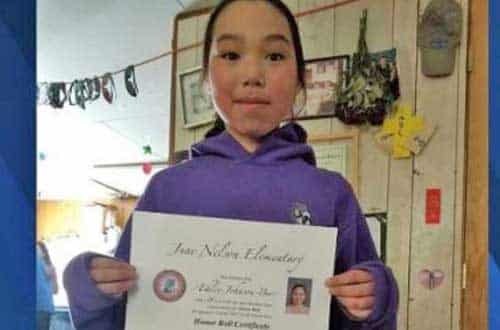 While the lone arrest made in connection to the disappearance and death of 10-year-old Ashley Johnson-Barr has only been charged with making false statements to a federal officer, authorities say that they have obtained a warrant to gather DNA and trace evidence samples from that Kotzebue man, identified as 41-year-old Peter Wilson, as they continue to move forward in the investigation. Soon after the investigation into the disappearance of the child was initiated, Wilson was questioned following the discovery of Ashley’s cell phone. When questioned, Wilson told investigators that he had found the cell phone on the west end of town near the regional corporation’s office building. The cell phone had been found by a person only identified as “JJ.” “JJ” told investigators that she found Ashley cell phone in the pocket of a jacket belonging to Wilson after she heard it repeatedly ringing. That person said when she picked the phone up she saw Johnson-Barr’s name displayed on the screen. “JJ” told investigators that she immediately called Ashley’s mother and reported the discovery, and the child’s father traveled to “JJ’s” residence and retrieved the phone and in turn turned it over the Kotzebue Police Department. When interviewed, “JJ” told investigators that Wilson and she had been at her mother’s house throughout the day of Ashley’s disappearance, but he left that residence at 5:20 PM on a four-wheeler when asked to go pick up “JJ’s” child and one other. When Wilson returned two hours later at 7:20 PM, he did not have either one of those children with him. When Wilson was interviewed by the FBI, he denied having been on a four-wheeler at any point that day. He also denied that he knew Ashley and also said that he never saw her name on the cell phone while it was in his possession. When Ashley’s parents were interviewed, they told investigators that Wilson and Ashley knew each other and that Wilson, their relation, had been at their home on numerous occasions. Wilson continued to assert that he had found the cell phone near the area of the NANA building, but when investigators accessed the geolocation data on Ashley’s cell phone, they would find that the phone had not been in that area, and instead had “traveled to areas well south and east of the location where she was last seen and where Wilson said he found the phone,” according to authorities. On September 14, eight days after Ashley’s disappearance, investigators traveled to all the locations that the phone had been to on September 6, and at approximately 4:15 PM Ashley’s remains were discovered about 1/4 mile off the road on the tundra 1 mile east of Kotzebue. While the investigative assets, that included 11 Alaska State Troopers, 17 FBI agents, and the local police and fire department, Coast Guard, and the US Fish and Wildlife Service have gone back to their regular duties, the investigation into Ashley’s death will continue with the majority of the work in that investigation being conducted in Anchorage. Investigators will travel back to Kotzebue as necessary throught the investigation. Currently, Ashley’s death is categorized as a suspicious death and not as a homicide investigation. That status may change as the investigation continues and the vast amount of evidence gathered in the case is further analyzed. Wilson, who was arrested on Friday, is due in court on Tuesday afternoon for arraignment on the charge of Making False Statements to a Federal Agent. He remains in custody.